I remember when I visited my home town and met for a coffee with my friends from high school. Three of the four of us entered the café pushing brand new Britax 2017 B-Agile. We looked at each other and started laughing. Yes, this stroller has many fans! If I had to describe it in few words I would say: light, multi-functional and easy to use. It makes going out with a baby more easy and enjoyable. Moreover, it can serve you for couple of years as an everyday city stroller, but also do double duty as a light travel stroller! I can truly recommend it to any other parent. Britax offers parents 3 solutions. 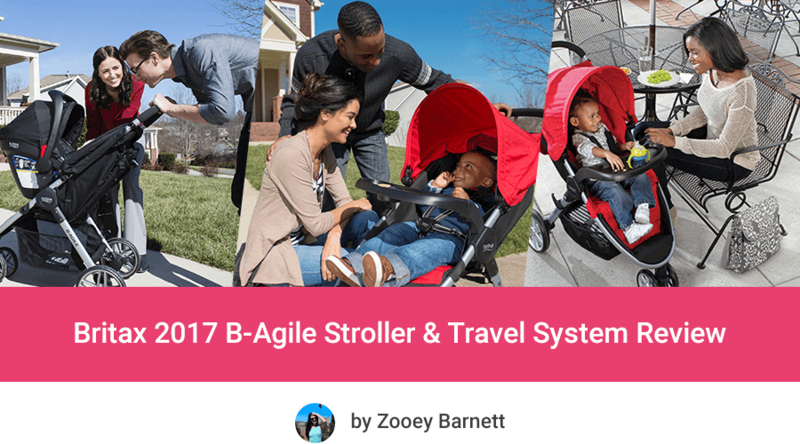 You can buy the B-Agile stroller independently or as a travel system. And you have 2 different travel systems to choose: Britax B-Agile/B-Safe 35 Travel System or Britax B-Agile/B-Safe 35 Elite Travel System. At first, let’s take a look on both Britax travel systems – one with the B-Safe 35 and the other with B-Safe 35 Elite. If you are interested in using this stroller for a newborn, travel system is a great solution, because you can start strolling with an infant car seat and then switch it for a regular seat. Great thing about Britax 2017 B-Agile is that when you buy it as a travel system you actually spend only few dollars more than when you buy only the stroller. On the market there are two Britax travel systems: Britax 2017 B-Agile & B-Safe 35 Travel System and Britax 2017 B-Agile & B-Safe 35 Elite Travel System. What is the difference between these two travel systems? Well, they come with different infant car seats. Speaking briefly, B-Safe 35 Elite has additional safety feature (extra layer of side impact protection) and thanks to no re-thread harness it can be quickly adjusted as the baby grows. What these two car seats have in common is that they don’t take up much space in the car! Many parents ask how the stroller works with Britax infant car seats. There is The Click & Go adapters that are included with the stroller. They click into the seat very easily. 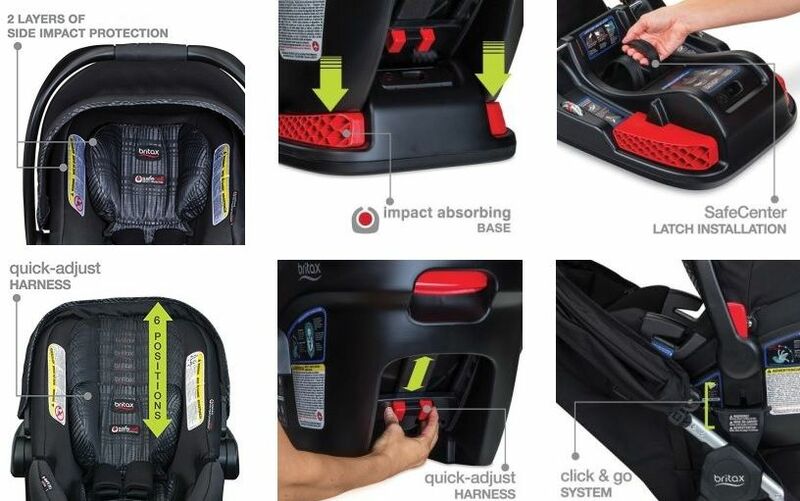 Currently there is a new version of the stroller and travel systems that comes with new infant car seat receivers, manufactured after the safety campaign resolution. 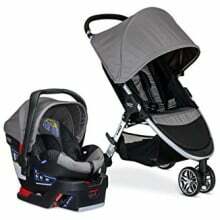 Thanks to this Click & Go receivers B-Agile stroller is compatible with Britax infant car seats. 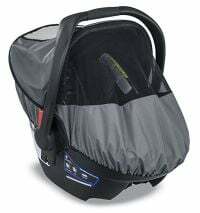 What’s included in the Britax travel system set? Remember that if you buy one of these travel systems, you will get the infant car seat base. But if you often use two different cars and want to quickly switch between them you can buy also the additional adapter separately. Great thing is that you can keep the base attached in the car and easily click the infant car seat into the stroller frame thanks to Click & Go receivers. Britax combined the newest version of their iconic best-selling stroller with their best infant car seat. This travel system comes with the B-Agile 3 stroller and B-Safe 35 Elite infant car seat. 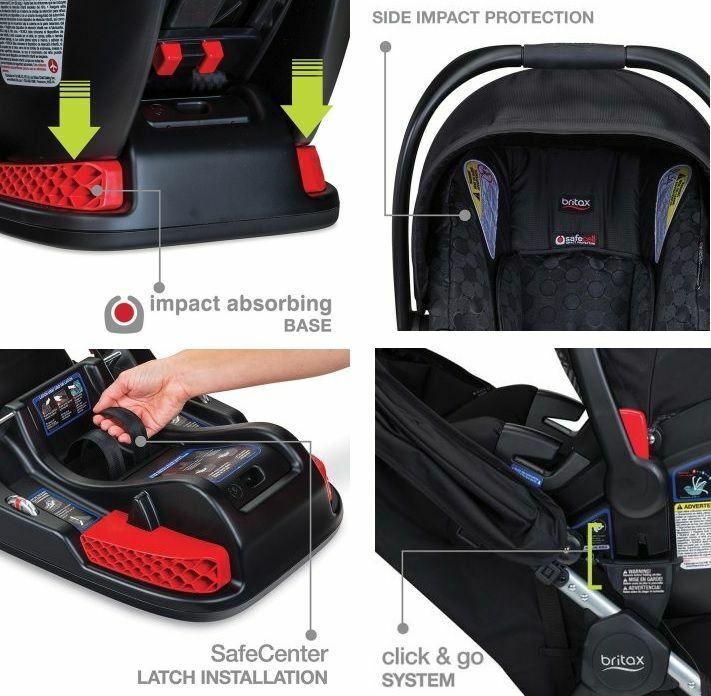 The infant car seat is suitable for baby from 4 to 35 lbs and it features specially designed by Britax SafeCell Impact Protection system. It is an integrated system of safety components like strong steel frame and base that compresses to absorb the rough force during a collision. This safety system protects the baby and provides a safe ride. What distinguished this infant car seat are the two layers of side impact protection: deep foam-lined shell that minimizes moving from side to side and quick-adjust head protection. These two layers absorb energy and protect the baby during an accident. The second layer is an additional safety feature. B-Safe 35 Elite has also new convenience feature: there is quick-adjust no-rethread harness which allow us to easily change the height of the harness as the baby grows. B-Safe 35 Elite and the whole travel system really grows with the baby! It is a set containing Britax 2017 B-Agile Stroller and Britax B-Safe 35 infant car seat. Thanks to this travel system going out with the baby is even more simple. This infant car seat also has the SafeCell Impact Protection system which includes impact absorbing base and steel frame. However, there is one layer of side impact protection. Deep foam-lined shell minimize side-to-side movement which means the baby gets maximum protection. With Britax 2017 B-Safe 35 your baby is kept safe in case of a collision thanks to energy absorbing shell. You can find more information about this infant car seat features and other parents opinions on Amazon. Below you can find a table with comparison: Britax B-Safe 35 vs and Britax B-Safe 35 Elite. Both travel systems (the stroller and infant car seat) were recently updated. Manufacturer improved the buckle on the infant car seat and the attachment system on the B-Agile Stroller. On the newest 2017 model all of the issues are fixed and these two travel systems are one of the best travel systems available on the market today. However, if you ask me which travel system I prefer I would definitely choose the Elite version. Both travel systems come with the same awesome stroller, but this one has just better infant car seat with one additional safety feature (which is my main reason) and one additional convenience feature. 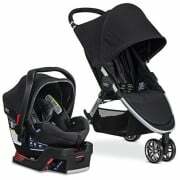 Besides, Britax 2017 B-Agile & B-Safe 35 Elite travel system cost only few dollars more than the regular travel system! I think it is a smart investment. There are few accessories for B-Safe car seats that are really useful. I’d wish this items were included, fortunately they are not expensive! 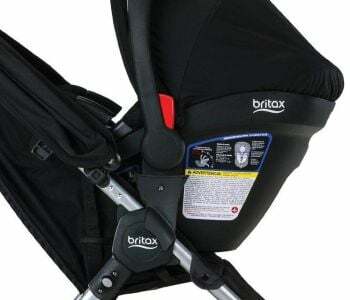 Britax B-Covered All-Weather Car Seat Cover – It is a shield for the Britax B-Safe infant car seats that protects a newborn from all weather conditions and insects. Britax Back Seat Mirror – It is indispensable if you are driving with your baby. The infant car seat have to be installed rear facing so during driving you wouldn’t be able keep an eye on your baby without this mirror. 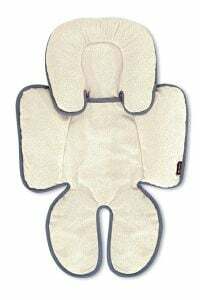 Britax Head and Body Support Pillow – Reversible design with moisture control fabric on one side, and soft plush on the other side to provide maximum comfort for the baby during all weather conditions and all seasons. It secure small baby in a place in an infant car seat or a toddler seat. It gives full support for baby’s body and delicate head. The head support is adjustable and detachable so it grows with the baby. Suitable for babies up to 22 pounds. It can be machine washed. Looking for a travel system for your baby? Check out my other reviews! In this section I will show you why B-Agile is so awesome and why so many parents have trusted it! Britax 2017 B-Agile is equipped with a regular, toddler seat that features multi-position recline. There is near-flat position which is crucial for comfy napping (no matter if your baby is 6 or 26 months old). To lower or lift the seat you need to use the straps placed on the back of the seat. It’s pretty easy. When the seat is fully reclined there is additional mesh window on the back which proves extra ventilation. Very useful during summer strolls as it prevents the baby from overheating. The seat is nicely padded with soft fabric on the bottom and back and the leg rest (not adjustable). Toddler seat features also 5-point harness that can be easily adjusted as the baby grows. Shoulder straps are additionally padded to give the baby more comfort. This regular seat can be used for baby with proper neck and head control and up to 55 lbs. However, this stroller can be also used for newborns because it can be bought as a travel system with Britax B-Safe 35 and Britax B-Safe 35 Elite infant car seat. Switching between infant car seat and toddler sit is super easy thanks to Click & Go system. Moreover, B-Agile is also compatible with other major car seat brands with additional adapter. The newest multi-adapter allows you to use Britax 2017 B-Agile with: Graco Snugride 32, Graco Snugride 35, Chicco Key Fit, Chicco Key Fit 30 and Peg Perego Primo Viaggio, however it is not compatible with Graco Snugride Click Connect models. There are also adapters for Maxi-Cosi, Cybex and Nuna infant car seats. 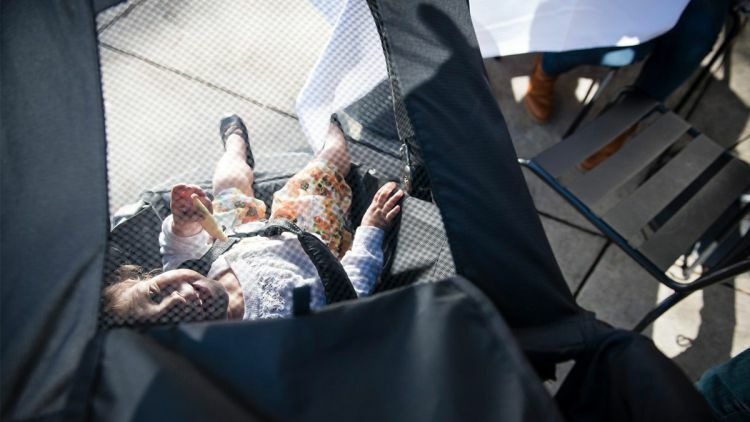 This stroller has a large sunshade with big mesh peek-a-boo window. You can easily see your baby through this window and it also provide extra air-flow. 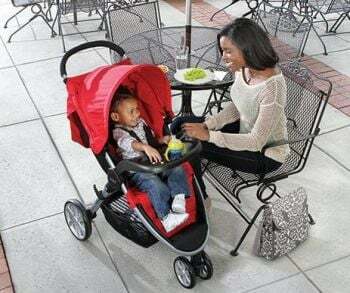 Thanks to that your baby can sit comfortably and enjoy strolls during sunny days. I’d only wish the closure was magnetic. When you open the window there is a hook and loop closure to keep the cover in a place. And for closing the window you have to use the Velcro. The canopy has however one big advantage. It gives really nice coverage, literally for head to toe! And it features UV 50+ protection to shield the baby for harmful sun rays. Britax 217 B-Agile features plastic wheels filled with foam, which can handle uneven sidewalks very well. I’ve taken this stroller also for an off-road trip over grass and it worked surprising good! Gravel might be more difficult, but in exchange for that, this stroller is amazing for city use. There is also all-wheel suspension which provides more smooth ride, so your baby can take a nap in peace or just sit comfortably and enjoy watching surroundings. I’ve also read other parents reviews and they all agree that with this stroller you don’t feel bumps and it rolls very smoothly. This stroller is made for urban parents who are often on the go with their kids. It won’t slow you down and will let you enjoy every moment with your baby. This stroller has single action brakes. The pedal has a good size and it’s easy to set and release, no matter if you are wearing sneakers, flip flops or high heels. Parents often ask me if this stroller is easy to maneuver. I must admit, this is exactly the feature that I love the most about Britax 2017 B-Agile. It has 3-wheel design therefore it’s easy to navigate through the crowd and turn, even in tight spaces. In fact it has ultra-tight turning radius. It’s also very convenient and compact to maneuver around in shopping stores. Besides, we can push this stroller literally with one hand! Not every full-sized stroller features such a great maneuverability. Britax 2017 B-Agile Stroller is SO easy to operate! The front wheel is also pivoting for even better agility. Yes, the name did not come from nothing. 🙂 This stroller definitely lives up to its name! 2017 B-Agile features non-adjustable handlebar. It has set at about 40.5″ from the ground. Parents ask often if the stroller will be comfortable to push for a short and tall person. Well, one of my friends that have this stroller is 5’2” and the other is 6′ and they both can easily steer this stroller. So I guess the height is convenient for short and average parents. The handlebar is covered with foam. Britax 2017 B-Agile features easy and quick fold. Just press the button on the side of the stroller, than pull a strap inside the seat and voilà! The stroller will immediately fold itself! I love how easily it works. If you have to go quickly to the city to run some errands you just grab the stroller, fold it in few seconds and throw it in the car trunk. It takes little space so it’s very convenient to transport and storage. Britax 2017 B-Agile folds itself in a few seconds! Before you pull the handle to fold the stroller, you have to push safety release button which is excellent feature. Thanks to it a child can’t fold the stroller while climbing on it. Britax takes care of our little ones really well! 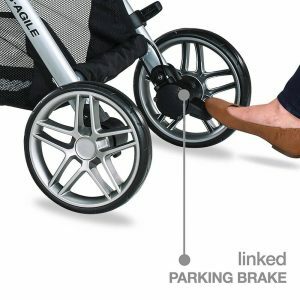 There is also an automatic lock so you can be sure the stroller will stay folded. Besides, you can also easily carry it thanks to thestrap inside the seat. 2017 B-Agile weighs only 18 lbs so it’s just a little bit heavier than umbrella strollers! This stroller weighs so little thanks to the aluminum frame. It is a full-features stroller, yet very compact and light. Perfect combination! 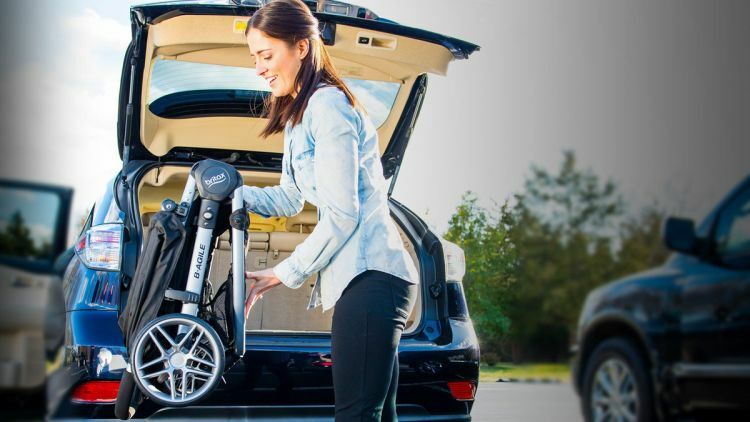 Britax 2017 B-Agile Stroller is easy to transport in a car trunk becauseit doesnt take up much space! Britax 2017 B-Agile offers large basket under the seat were you can keep 10 lbs of your belongings and baby’s essentials. Parents often ask if the basket can accommodate all necessities for a day trip. Well, I fit there a large diaper bag and my handbag, so yes, I think that with this basket you are ready for a day trip! What I also like about this storage is the easy access it offers from the back, even if the seat is fully reclined. In few strollers that I tested the access to the bin was blocked when the seat was reclined. In addition, there is also a large pocket placed on the back of the canopy with zip closure. You can keep there your keys, phone or even a wallet. If very useful. With 2017 B-Agile you have your essentials within reach. Setup was very, very simple and quick – actually one of fastest from all of the strollers I’ve tested! It took me like 5 minutes to put the stroller together and I didn’t have to use any tools. The manual is also pretty understandable. Britax 2017 B-Agile has nice shape and thanks to that we don’t kick the real axle during a stroll. Frame is made of light aluminum thanks to which the stroller is so easy to carry. I like the fabric on the seat, it’s soft, yet very durable and doesn’t rip. Top-notch work! 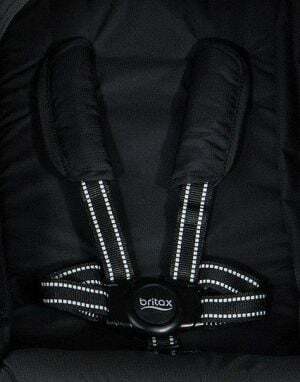 Britax Stroller Organizer – Very useful additional storage that straps to the handlebar. The straps that fasten it to the handlebar are adjustable. There is a big compartment with magnetic closure where we can keep some snack or a baby diapers. There are also 3 external pockets for keys, phone and other small items. This parent organizer has also two beverage holders. Thanks to this accessory you will always have a quick access to your essentials. 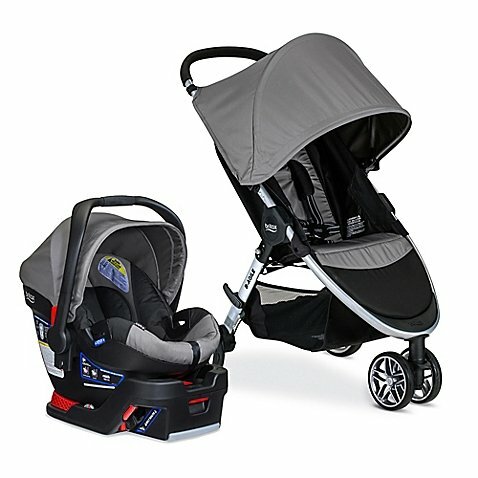 It’s compatible not only with all Britax strollers, but also major other stroller brands. 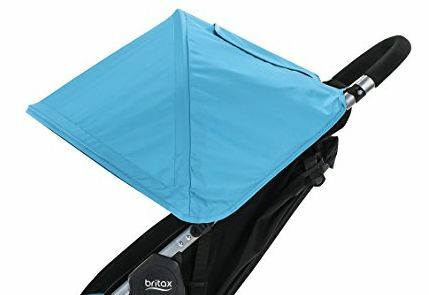 Britax Child Tray – It easily attaches to the frame. It has one beverage holder and place for baby’s snacks. Very useful accessory. 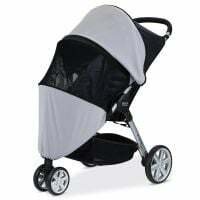 Britax Sun and Bug Cover – It wraps around the stroller to protect your child from insects and harmful sun rays. It provides also a great ventilation thanks to mesh fabric. Your baby can take a cozy nap and you don’t have to worry he or she will be bite or gets too warm. If you live in area with a lot of seasonal bugs, this shield might be a must! Britax Rain Cover – Thanks to this gear you can be sure your baby is well protected from the rain and wind. 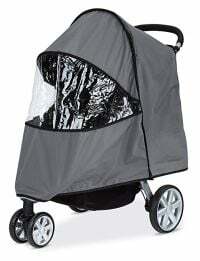 This shield is made of clear vinyl and drapes over the whole stroller and attached thanks to hook and loop. It will keep your baby dry, without blocking their view. If you live in area where rains often it will be essential for you. 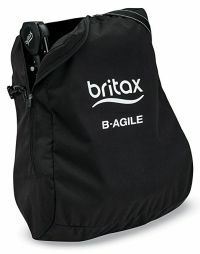 Britax Travel Bag – Great piece of gear especially if you plan to travel a lot with your B-Agile Stroller. It fits folded stroller with the wheels on. It also makes storage more easy. Britax 2017 B-Agile Stroller is available in five different color versions: black, meadow, red, cyan and steel. Travel system with B-Safe 35 infant car seat is available in the same color versions, and the car seat has the same fashion as the stroller. Here you can check prices of all color versions for Britax B-Agile & B-Safe 35 Travel System. The B-Agile/B-Safe 35 Elite Travel System has different three color versions: Domino, Cowmooflage and Solstice. You can see the color options below. The price and discounts may vary, depending on the color version you choose. Click here to compare prices of different colors for Britax Elite Travel System. 2-year manufacturer warranty for the B-Agile Stroller and 1-year warranty for the B-Safe infant car seats. Britax 2017 B-Agile & B-Safe 35 and Britax 2017 B-Agile & B-Safe 35 Elite travel systems are highly-rated on Amazon. 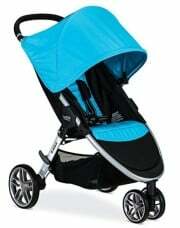 They praise the high-quality and durability (some parents even use the stroller for years!). Moreover, they like how light and nimble this stroller is. Another advantages are safety features of the car seats and quick transfering from the car to the stroller. One parent complained about the unadjustable handlebar. 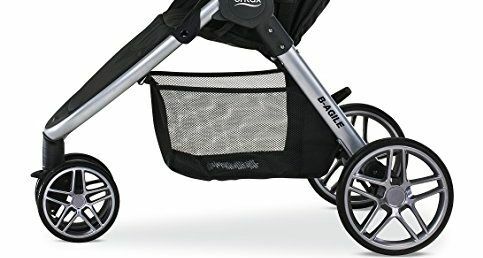 This stroller is great for city use, it handles sidewalks and grass. It’s easy to push and navigate even through tight alleys in shopping stores. And if you buy a travel system for example with B-Safe 35 Elite Infant Car Seat it may be actually the only stroller you will ever need! You could use it since birth till our baby can walk and doesn’t want to ride in a stroller anymore. Overall, it is a high quality product and an investment for years. This stroller has dual front wheel which is not good for sand or gravel as it may get stuck on that surface. However, it handles many other terrains really well and the ride over bumps is cushioned. Also, keep in mind that the stroller seat is not removable, so with the infant car seat attached the whole stroller is more heavy and bulky. 1. With Britax B-Safe infant car seats you can be sure your baby is protected during riding and strolling. 2. Both travel systems are top-quality for pocket-friendly price. And since you can use them from birth to toddlerhood, you won’t have to spend money on another stroller! 3. Forget about heavy and clumsy stroller! Britax B-Agile is a full-sized stroller with many useful and versatile features, yet it is nimble, easy to turn with one hand and light enough to carry around effortlessly! Do you like Britax B-Agile Stroller and B-Safe infant car seats? Before you make your purchase make sure to compare the price of the stroller, car seats and travel systems and read what other parents say about them on Amazon!